Another day, another great resource available from us here at Anthony Cole Training Group. Are you ready to change the way you approach prospects to close more sales? In his audiobook, Motivating Prospects to Take Action, Tony Cole shares with you how to identify the 3 different types of prospects and how to tailor your approach to help prospects make decisions. You will learn the right questions to help identify severe mental anguish and get prospects to take action! Interested in receiving a Free copy? Download available below! What does it take generate and convert leads and hire sales people who can consistently perform this ultimately necessary job? But it’s not that simple. Every president and sales manager I’ve talked to over the last year, tell me that the biggest challenge their sales people face is creating enough leads, converting those leads to opportunities and then converting the opportunities to revenue. If you’ve read my posts in the past you may have stumbled across one that talks about growing up on a blueberry farm in Hammonton, NJ. Little did I know at the time that my early life would help me better understand the world of selling. Growing up on a farm is about surviving. Our family survived season after season, year after year. We were never rich, never had extra money, were never able to save for a rainy day much less put money away in a retirement account. Surviving then (and probably now for most of those who work in farming) required three important skills and behaviors and discipline to be successful. I assure you that none of the following three “lead generation and selling” activities were easy. These activities required a commitment to succeed, a not-an-option mindset, specific skill sets and a vow to do everything possible to succeed. Hunting – my dad hunted, had to hunt, to put food on the table for six of us. Farming – we grew blueberries, peaches and strawberries. Mom and dad sent hours canning peaches and freezing strawberries and blueberries so mom could make pies in the winter. They also bartered for tomatoes from neighbors and other local farmers and canned jars and jars of tomato puree. Trapping – Years after I left the farm my dad started trapping muskrat and fox to make money from the pelts and had a garden that supplied their winter supply of canned vegetables. He also had a friend in one of the local rangers who would casually mention when there was fresh deer meat nearby. Growing sales requires lead generation. Today’s lead generation activities are different than those of a few years ago, different because today’s prospects are different. They are different because technology, the amount of information and the mobile ability to access information, has been a game-changer that favors the buyer. Today’s sales person can no longer rely solely on traditional prospecting skills and behaviors to generate leads. Today’s successful sales person must have the hunting DNA but must also diversify efforts AND become more effective. When we assess sales talent within an organization or screen sales candidates, we help our clients minimize the high costs of hiring ‘ghosts' with findings in several important areas that help determine if the sales person or sales candidate has the aptitude and skill to develop new business. As you can see from the exhibit below, very specific skills are needed to be a successful hunter. A hunter must be able to get past “gatekeepers” to reach decision makers, attend networking events and consistently prospect. But look at all the ‘stuff’ that you may not have known are critical to generating enough leads. Generating leads today includes additional skills and aptitudes, as well as traditional people skills and aptitudes. Examples include: Uses sales 2.0 tools, gets referrals from customers/network, has no need for approval, WILL Prospect! We’ve been doing a fair amount of research into lead generation through our primary source, Hubspot. We’ve had a long business relationship with them because they provide a great platform for all things that are digital marketing and associated data. One thing we will begin to take better advantage of is their CRM application. This will allow us to tie our marketing efforts directly to a client management AND pipeline management system. Predictability of future sales revenue is dependent upon knowing exactly what is going into the pipeline – lead generation – and the conversion of those leads throughout your sales process. How well aligned is senior management, including those leading the marketing effort, with sales management and the sales force? 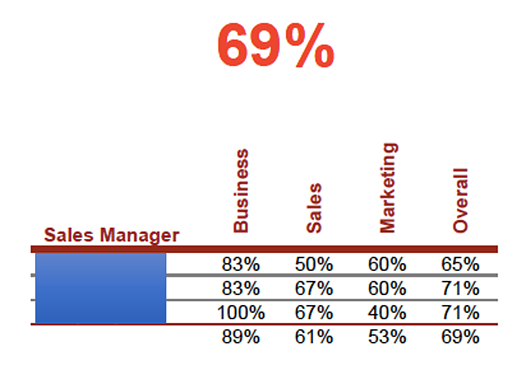 Our data, using the Objective Management Group Sales Force Evaluation, tells us that there is usually a significant disconnect between leadership and management when it comes to the following strategies: Business, Sales and Marketing. Below see the findings from a bank with three managers. Their overall alignment with senior leadership is 69%. A series of questions are asked of the president of the bank and his three market presidents. The percentages indicate how often the answers from each of the market presidents match with the bank president. As you can see below the marketing area is where they are least aligned at 53%. This isn’t the end of the problem. We also asked all of the relationship managers (16) to write out the bank’s value proposition, brand promise and elevator pitch. Overall results (not shown) indicate that less than 50% of the relationship managers in the group were able to express the value proposition with any consistency and only 25% responded with the correct brand promise. On the other hand, there was a 75% consistency in the elevator pitch. Assess your sales management team to identify the variance in strategy alignment and the messaging being communicated by the sales team. Communicate, train and coach sales managers on how to effectively deliver the brand promise, the value proposition and the elevator pitch. Have sales managers perform joint calls with relationship managers so that they can observe and critique delivery of the message. Create and embed email templates within your CRM system that RMs may use when communicating to suspects, prospects and clients. Overstate the brand promise in sales meetings. The First Moment of Truth isn’t what it used to be. I’ve quoted this research before, The Zero Moment of Truth (ebook), because it helps companies understand that the buying process has changed dramatically. The first moment of truth in the selling/buying process used to be initiated by a sales person. That is hardly the case anymore because sales people simply cannot get to influencers and decision makers any more. The buyers are either out or busy! Buyers today begin the buying process when they are stimulated by something they have seen, heard or read via the dozens of access points they have via the digital / technology / internet age. 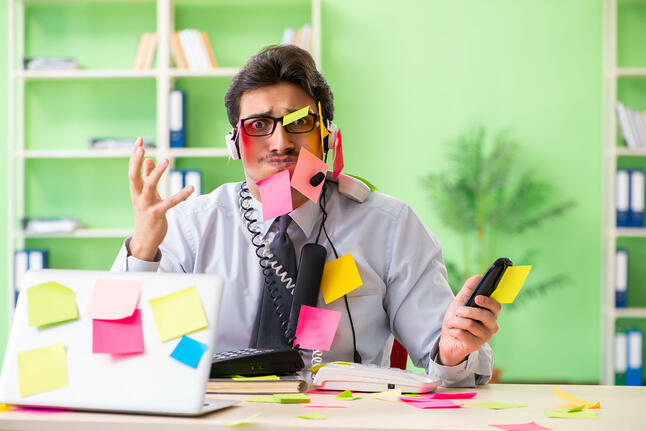 The first moment of truth for your sales people today may in fact be the first time they’ve had the chance to talk to a suspect but what they don’t know, probably never knew, is if the buyer is an active or inactive buyer and has already begun the process. This person may already be in the ‘Awareness’ stage of their buying journey and maybe in the middle of their “Assessment Stage’ of their buying journey. Identifying the stage is more important then finding ‘pain’ in this first moment of truth. Understand that in order to get someone to move your sales people from the assessment stage to the buyers decision stage they have to be more informative. Informative about things that they buyers doesn’t already know. This doesn’t mean ‘pitch’ them on the features and benefits of your products or solutions. The world of buying has changed. It’s time to change the world of selling. How well does your team measure against your industry? 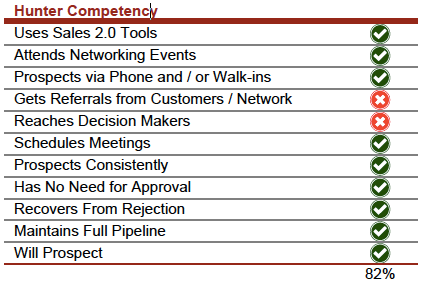 Assess your salespeople on the 21 core selling competencies. At some point that title won’t make me think of the great Jack Nicholson and his role as Colonel Nathan Jessup in the 1992 movie “A Few Good Men” … but it is safe to say that point in time is a long way off for me. It is one of my all time favorite movies. For now, that famous line from Colonel Jessup has me thinking about how selling has changed so dramatically even within the last few years. So, if you can handle the truth, here is the truth: selling has changed…but salespeople have not. The buyer is initiating the sales process…what HubSpot refers to as the buyer’s journey. The buyer is further along in their thinking than ever before. The first change brings to mind the 2011 Google eBook titled “ZMOT”. ZMOT is an acronym standing for the Zero Moment of Truth and is defined as the exact moment in the sales cycle that is between the stimulus (how the prospect became aware of a product) and the first moment of truth (a P&G term referring to the decision to make a purchase). In short, ZMOT refers to the point in time where the buyer is researching a product or service offering and the seller is completely unaware of the buyer’s actions. Is your company winning or losing at the Zero Moment of Truth? It is inarguable that more and more buyers are finding and researching options online before they ever talk to a salesperson. Some estimates have YouTube doing 3,000,000,000 searches each month and uploading 100 hours of video every 60 seconds. And if they can’t find you…when they are looking for you…even if you don’t know they are looking are for you…. you are losing the Zero Moment of Truth. As Colonel Jessup would ask “We live in a world full of prospects…who’s going to call them? You? They may have already passed their Zero Moment of Truth."